F. J. Perry beating H. W. Austin with a fast return at the exhibition by international tennis players at Basford this afternoon. International lawn tennis stars appeared in exhibition games at Basford Tennis club to-day, under the auspices of the Staffordshire Lawn Tennis Association. 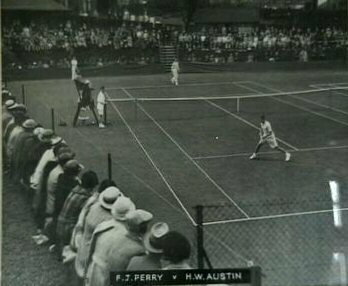 The exhibition opened with a singles match between F. J. Perry and H. W. Austin, both wellknown Davis Cup players. The other players who appeared were G. P. Hughes and C. M. Jones, the winner of the Sutton Tournament as recently as Saturday last, Miss K Stammers, who is ranked jointly with Miss Dorothy Round as Britain's No 1 woman tennis star and Miss Lyle. A large crowd of tennis enthusiasts from a wide area witnessed the attractive programme, and although play was not due to begin until 3.0 p.m., the crowds were assembling as early as 11.45 this morning. Adequate arrangements were made for the spectators by Mr. F. T. Jacks, the Secretary of the Staffordshire Lawn Tennis Association, and by his co-officials. The Basford hard courts were in excellent condition, and the raised seating accommodation over the sunken courts gave the spectators ad admirable view of play. The exhibition opened under brilliant conditions with a singles match between Perry and Austin, Perry winning the set at 10-8 after a beautiful exhibition of tennis. Austin began well and took the first two games, the second one without dropping a point, this being against the service. Perry took the third game, in which he displayed much of his old aggression, two untakable returns being features. Perry levelled at 2-2, and showing a willingness to come up to the net, placed some brilliant forehand drives. Perry took the lead for the first time at 3-2, but Austin, playing at the top of his form, in the next game drew up to 3-3 by some immaculate tennis. Austin went ahead again to lead at 4-3, exhibiting brilliant backhand shots, but Perry, always at his best when in arrears pulled up to level again at 4-4. Perry's hard hitting turned the scale in his favour in the next game, in which he continually placed the ball with unfailing accuracy on the baseline and finally caught Austin on the wrong foot, to lead 5-4. Austin was consistent and levelled again at 5-5, led at 6-5, but Perry's brilliant smashes in the next game enabled him to take the score to 6-6. The score went to 7-7, and then Perry did some superb retrieving from both corners of the court to lead at 8-7. Austin got to 8-8 by means of some beautiful tennis, and then Perry, who had an ability to pull up at almost any stage, went ahead at 9-8, and took the set at 10-8, showing wonderful agility about the court.